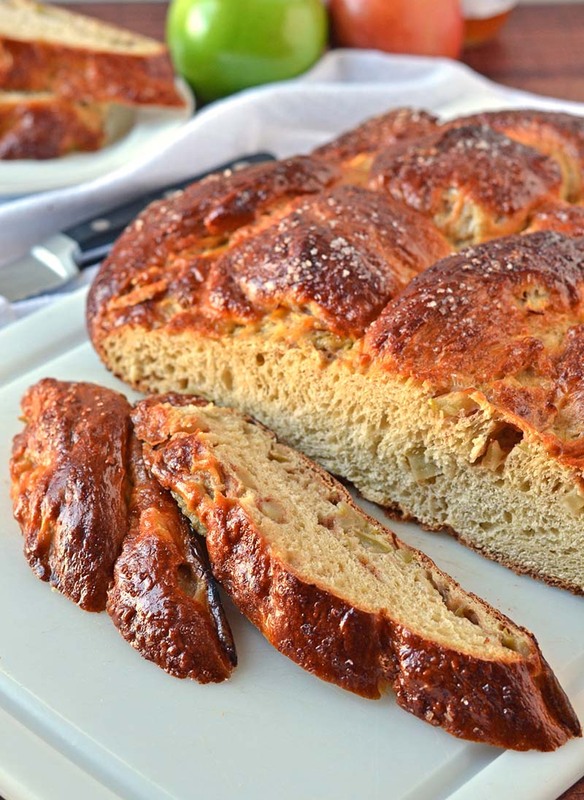 Fluffy honey-sweetened challah bread stuffed with apples and cinnamon. Perfect for special occasions and makes incredible French toast. Make the dough: In the bowl of a stand mixer fitted with the paddle attachment, stir together the white whole wheat flour, all purpose flour, vital wheat gluten, yeast, and salt until combined. Add the water, honey, oil, eggs, and egg yolk. Mix on medium speed until the ingredients are just combined into a shaggy mass. Switch to the dough hook, reduce speed to low and mix 6 minutes, until the dough is smooth, elastic, and slightly sticky. If making dough by hand: In a large mixing bowl, stir together the white whole wheat flour, all purpose flour, vital wheat gluten, yeast, and salt until combined. Add the water, honey, oil, eggs, and egg yolk. Stir with a wooden spoon until the ingredients are just combined into a shaggy mass. Turn the dough out onto a floured work surface and knead until dough forms a smooth, elastic ball, about 8 minutes. Flour the dough as little as possible to prevent it from becoming tough. Lightly coat a large, clean bowl with cooking spray. Transfer dough the bowl, turn to coat, then cover with plastic wrap that has also been misted with cooking spray. Let dough rise in a warm, draft free place for 1 hour or until almost doubled in size. In a small bowl, toss together the apple pieces, cinnamon, and lemon juice. Once the dough has risen, turn it out onto a lightly floured surface and gently press it into a long, flat oval. Spread ⅔ of apple pieces over ½ of the flattened dough, leaving the other half of the dough empty. Fold the uncovered dough half over the apples and press down to flatten. (The dough will be lumpy.) Repeat the process, spreading the remaining apples over ½ of the folded dough again. Fold the uncovered dough half over the apples, pressing it down once more, leaving you with a semi-square shape. With the sides of your hands, gently tuck the corners of the “dough square” under to form the dough into a round. Turn the bowl in which you let the dough rise over the top of the apple-dough ball so that it is covered. Let sit for 30 minutes. Weave the bread: Divide dough into 4 pieces by cutting it in half vertically, then horizontally (your cuts will form a plus sign.) Carefully roll and stretch each of the pieces into a 12-inch rope (be sure to measure!) If any apple pieces fall out as you go simply press them back in. Take two ropes and lay them side by side so that they are touching. Arrange the other two pieces across the dough in a perpendicular manner so that you are creating a big plus sign, weaving the pieces so that one side is over and the other is under in the center where they meet (as if you are creating a basket weave). Your dough should now have eight “legs” coming out from the center where they cross. Find each of the four legs that are emerging from “under” the center of the dough weave (these will be every-other rope). Lift each leg over the rope to its right. Find the legs you have not yet moved. Lift each of these legs up, over, and to the left. If you had extra length to the ropes, repeat these left-right jumps until no length of dough remains. Tuck any corners or bumps under the dough with the sides of your hands to form a round. Line a heavy baking sheet with parchment paper and gently transfer the woven dough to its center. For the egg wash, beat the egg until smooth and brush it liberally over dough. Let dough rise uncovered for one hour. Reserve egg wash.
Place rack in the center of oven and preheat to 350°F. Before baking, brush loaf once more with the reserved egg wash and sprinkle with coarse sugar. Bake for 30 to 35 minutes, until the loaf registers 195 degrees F at its center. The loaf will bronze deeply as it bakes, but check it at the 30-minute mark. If it is browning too quickly, cover the loaf with foil for the remainder of the baking time. Let loaf cool on a wire rack, slice, then serve. I cannot visualize the way to braid this bread. Could I just make a regular 3 strand braid? I love the way this looks, but I really think I will love the way it tastes.